It is the 160th anniversary of the Eureka rebellion in 1854, when the gold diggings took up arms against the injustice and harsh treatment by colonial authorities with the growing push for democratic reforms in the Australian colonies. It led to Colonial authorities ordering a military attack on the crude Eureka stockade on Sunday – the sabbath day – December 3, 2014. While the battle raged for perhaps 15 minutes, the butchery, burning and pillaging by the Victoria Police continued over a wide area for a couple of hours. Although 22 diggers bodies were buried in a group grave at the Old Ballarat Cemetery, some rresearchers estimate that with martial law in place many diggers would have gone into hiding and some would have subsequently died of their wounds. The death rate may be over 50, but we will never know the exact number. At least one anonymous woman is knon to have been killed in the battle or subsequent massacre at Eureka. Ballarat has become synonomous in Australia with Eureka and the roots of the democratic tradtion and resistance in Australia. The stylised flag appears on the logo for Ballarat City Council, Federation University and many local businesses. So you would think the city would take pride in the story of Eureka, the history, the remembrance of those who fell defending their rights and liberties. Yet when Joe Toscano first visited Ballarat on the anniversary of Eureka on December 3 in 2002, he found no events of commemoration on the anniversary date, although Eureka’s Children and the Eureka Museum were holding events on the nearest weekend. From 2002 Joe Toscano and a small collection of people set out to remember the radical spirit of the Eureka Rebellion on each anniversary on December 3. What we found over succeeding years as a litany of shame in the local history and heritage and intransigence by the local council in even taking some pride in the Eureka history. 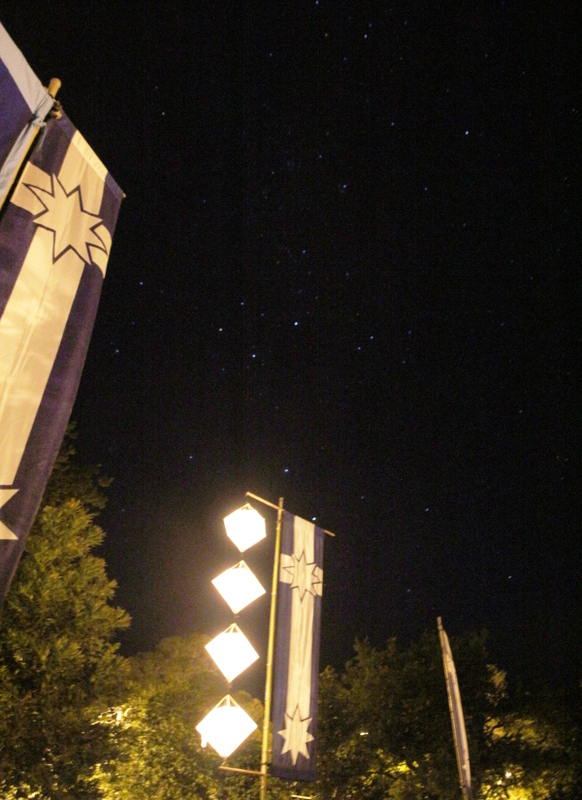 In 2013 we found the Eureka Flag flying from the flagpole on Bakery Hill threadbare and in urgent need of replacement. Over succeeding years the diggers grave in Old Ballarat Cemetery has had a lack of mainenaince with weeds and occasionally no flag flying on the flag pole. This is what we found in 2014: weeds, a few old plastic flowers and no Eureka Flag. The soldiers ar memorial – a British war graves site – we found to have been mown recently but no British flag flying from the flagpole. The streets of Ballarat are awash with Christmas decorations, but the only official Eureka flags or Eureka bunting we saw were at the Museum of Australian Democracy at Eureka (MADE) in Eureka Park, on the flagpole at Bakery Hill, and a secondary flagpole atop Ballarat Toen Hall. There was no bunting, no outward sign of the city celebrating it’s historical traditions as a significant birthplace for democracy in Australia. The Victorian Government in June 2014 funded $300,000 (Ballarat Courier) to celebrate the 160th anniversary. Granted there is a new sculpture – the pikeman’s dog – in Eureka Park and an official memorial service on the morning of December 3, and perhaps money also went to organising other events. But there are few outward signs the money has been spent in the simplest of tasks of maintaining the graves of those who died at Eureka, both diggers and soldiers. This would be scandalous in most countries of the remembrance of such an iconic historical event. So each year Joe Toscano, myself and a collection of other people, some local, some from Melbourne, and some from even further afield, travel to Ballarat to commemorate the spirit of those who fought for their rights and liberties and were slaughtered and butchered on the battlefield of the Eureka lead. The #Ballarat Courier finally made it along to the #Eureka160 dawn vigil this morning, although they were late. Better than last 9 years. At Ballarat Town Hall we remembered Bill Deller and his great stump speech in 2013 on Enough is Enough. Stump orations outside the Town Hall will become a regular feature. I was wrong, it was $300k for #ballarat160, yet #Ballarat diggers grave in disrepair, no flags or bunting. No pride, Where was money spent?